Easy marinated and spice rubbed Sheet Pan Fajita Salmon oven roasted to perfection is incredibly juicy, tender and bursting with flavor all smothered in Cilantro Lime Butter! You can serve this Fajita Salmon with rice and/or beans in a bowl, tortilla or salad with all your favorite fajita toppings for a healthy, delicious, complete meal-in-one that’s different every time! Whisk the fajita seasoning with 1/4 teaspoon salt and 1/4 teaspoon cayenne pepper. Set aside. MARINADE: In a shallow large bowl or dish, whisk together all of the Marinade ingredients. Remove 1 tablespoons to use later for vegetables. Add salmon and marinate 30-60 minutes at room temperature. Meanwhile you can prep your veggies. Preheat oven to 400 degrees F. Line baking sheet with foil and spray with cooking spray. Add onions and bell peppers to baking sheet. Sprinkle with 1 tablespoon fajita seasoning, 1/4 teaspoon salt and drizzle with 1 tablespoons olive and 1 tablespoon reserved marinade. Toss until evenly coated then spread evenly on baking sheet. Roast 5-10 minutes depending on thickness of salmon and how done you like your vegetables (5 minutes if you have thicker salmon because peppers will cook longer with salmon, closer to 10 minutes for thinner salmon, because peppers won’t cook as long with salmon). Broil salmon and veggies for 1-2 minutes or until veggies are slightly charred and salmon is golden. Spoon Cilantro Lime Butter evenly over salmon (directions follow). Season with additional salt and pepper to taste. 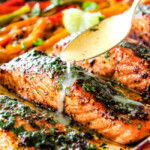 Serve salmon and veggies in tortillas or on rice or salad with toppings of choice such as black beans, tomatoes, avocados/guacamole, sour cream, hot sauce and additional freshly squeezed lime juice if desired etc. Melt butter in a medium bowl. Stir in lime juice, cilantro and salt. **Cooking time will vary depending on the size and thickness of your salmon fillets. Roast until the salmon is cooked through and flakes easily, 4 to 6 minutes for every 1/2-inch thickness of salmon. An instant-read thermometer into the thickest part of the fillet should read 120°F to 130°F for medium-rare or 135°F to 145°F for more well-done.